Is your workplace inspiring, engaging, and productive or frustrating, dull, and stagnant? Or, is it somewhere in between? Effective leaders pay attention to the quality of their work culture, every day. They know that culture drives everything that happens in their team or department or company, good or bad. They invest time and energy observing interactions, engaging with players and customers, celebrating aligned behavior, and coaching misaligned behavior. Unfortunately most leaders don’t pay much attention to the quality and health of their team, department, or company culture. They’ve never been asked to manage their team culture. They’ve been asked to manage results. Not surprisingly, most leaders spend a great majority of their time and energy on processes, performance, and profits. That’s all they know. That’s what their bosses did. They’re simply modeling what they’ve been exposed to over the years. Most leaders haven’t experienced a successful culture change during their careers. Even fewer have led a successful culture change. This wouldn’t be a problem if most organizational cultures were healthy, engaging, and inspiring. But, according to the research – and to our own experiences, they’re not. A 2009 Conference Board study found that only 45 percent of employees are even “satisfied” at work. TinyHR’s 2014 engagement and culture report found that 49 percent of employees are not satisfied with their direct supervisor and only 21 percent of employees feel strongly valued at work. Tim Kuppler noted in this CultureUniversity.com article that 96 percent of respondents in a 2013 Strategy & Survey said that some form of culture change is needed in their organization. Tiny HR’s report found that 64 percent of employees do not feel they have a strong work culture. Given these sobering facts, it’s clear that our work environments are not engaging, inspiring places today. If a work culture doesn’t treat employees with trust, respect, and dignity in every interaction, productivity drops, customer service drops, and output drops. Leaders must pay attention to the quality of their work culture and they need to proactively refine that culture so that team members feel valued in every interaction, every day. I’m not suggesting leaders ignore performance. Performance is a good thing! Meeting performance expectations means you’re keeping promises to customers and stakeholders. Leaders have many data points and dashboards that tell them how well their team is performing to defined standards. They watch those metrics carefully and coach to keep teams on track with performance. To boost the quality of their team culture, leaders must pay as much attention to values as they do to performance. Formal values, defined in behavioral terms, specify what a “great corporate citizen” looks, acts, and sounds like. When values are defined in observable, tangible, and measurable behaviors, leaders can create data points and dashboards that tell them how well players are modeling desired valued behaviors. One of the most effective data points is a custom values survey, completed twice annually, that allows employees to rate leaders on the degree to which those bosses demonstrate the desired valued behaviors. Leaders can monitor values survey results carefully – and can observe day-to-day interactions carefully – and praise aligned behavior and re-direct misaligned behavior. Only after the team or department or company’s leaders have embraced the valued behaviors are employee invited to demonstrate them. The leaders create credibility for these “new rules” – the valued behaviors – by modeling them consistently. Let’s get specific about what effective values look like for a team, department, or company. Values — if they are defined at all — are typically defined in ratty lofty terms. Vague definitions are difficult to translate into real-time interactions — they’re ideas, not clear behavioral parameters. 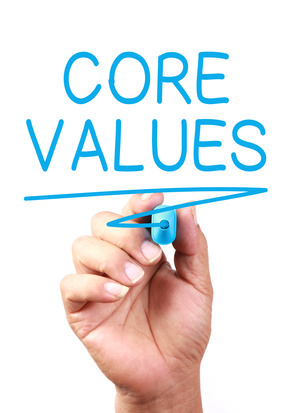 To make values as measurable as performance, values must be crisply defined and present specific behaviors that, when demonstrated, ensure players are living your desired values. The core of this definition two main ideas — “Give every customer superior service at every opportunity,” and, “Be our best.” Would you agree that this definition leaves little doubt about what this company means by service? I initiate friendly hospitality by promptly and enthusiastically smiling and acknowledging everyone who comes within 10 feet of me. I passionately exceed customers’ expectations by offering solutions to their needs. I assist each customer in finding requested items or service. Are these behaviors complicated? No. Are these behaviors measurable – could you observe team members’ interactions and assess the degree to which they’re demonstrating these behaviors? Absolutely. Are these behaviors “doable” — by anyone? They are. When values are defined in observable, tangible, measurable terms, you can live them, coach them, celebrate them, and reward them — just like you do with performance expectations. If values are not defined in measurable terms, all you can do is hope that players live them. Making values as important as performance works, and here’s proof. By aligning to desired behavioralized values, companies enjoy growth in three key areas: employee engagement (a 40 percent boost in 18-24 months), customer service (also a 40 percent increase), and results/profits (a 35 percent increase). Those are impressive benefits. Pay attention to your company culture. Consider adding formal values expectations, defined in behavioral terms, to performance standards already in place. You’re going to be there, anyway. Why not boost the health of your team culture, starting now? Questions to ponder: What values are demonstrated in your team or company culture today? What values did your best bosses embed in your team culture? For nearly three decades, S. Chris Edmonds has helped senior leaders create purposeful, positive, productive work cultures. He is a speaker, author, executive consultant, and founder of The Purposeful Culture Group. He’s one of Inc. Magazine’s The Top 100 Leadership Speakers for 2018 and was a featured presenter at South by Southwest Driving Results Through Culture. Chris is the author of the Amazon best seller The Culture Engine: A Framework for Driving Results, Inspiring Your Employees, and Transforming Your Workplaces and five other books. He tweets on organizational culture, servant leadership, and workplace inspiration at @scedmonds. Chris’ crisp, rich Culture Leadership Charge video episodes can be found on YouTube and podcasts on iTunes: Driving Results Through Culture.